The value of supportive comics community is vitally important to us here at Broken Frontier sitting, as it does, at the very heart of our mission statement. So projects like today’s Thought Bubble-debuting subject Work are exactly the type of initiatives we like to promote on the site. 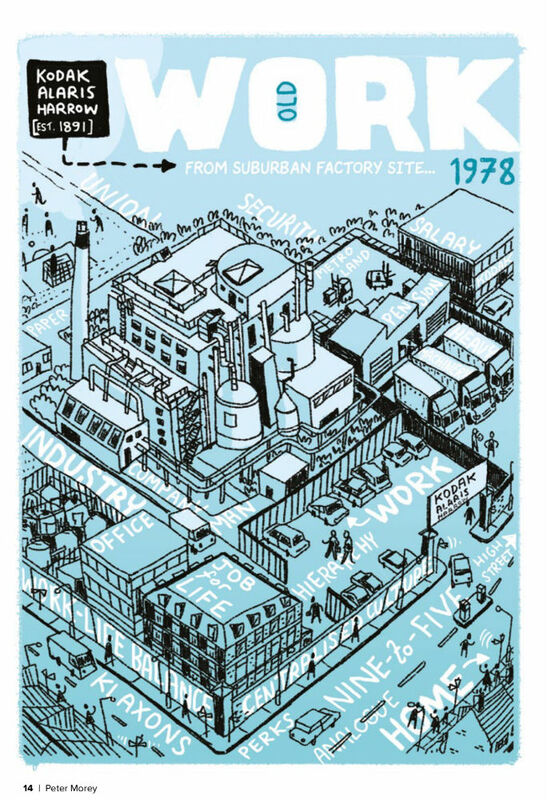 Collecting short strips by creators from the London-based Work in Progress Comics Meet-Up Group (run by Joe Stone whose Stutter we reviewed last week) this anthology focuses on the world of employment and features comics from a number of regular faces at our monthly Gosh! Comics and Broken Frontier Drink and Draw. It’s published in association with the London Graphic Novel Network. 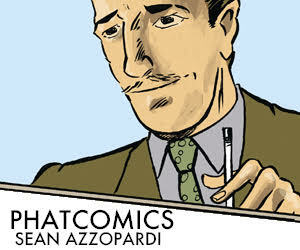 Approaches to this much visited topic of small press comics are richly varied in these pages. They range from the expected slice-of-life entries about the trials of the working day to more fantastical or whimsical offerings. The levels of technical ability vary quite significantly – as would be expected given the group exists to encourage, discuss and give feedback to newer creators in a mutually supportive environment – but the overall standard is very high. The immediate standout is Peter Morey’s two-pager ‘Old Work New Work’ (above right), comparing the same workplace 40 years apart with a map-style diagrammatic slant; lettering and workplace-speak contrasts attitudes and outlooks over the decades, conveying its message with an intuitive flourish. Bruno Stead also plays with the passage of time in ‘Rat Race’, another recognisable account of the daily commute; the tediousness of that morning train routine underlined panel-to-panel across the space of a week. 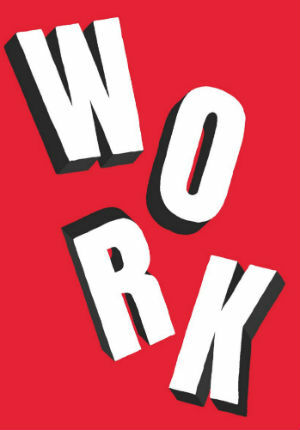 Elisabeth Flett’s ‘Work: An Autobiography’ touches on familiar themes too, making clever use of lettering tricks to emphasise just how easy it is to put off that promised pre-work early night. The more allegorical strips include Nick Bryan and A.I. Miller’s ‘Retirement Plan’ (above) with two wistful robots commenting on the changing face of their environment. Miller’s quirky visuals are a true highlight of the book, somehow managing to invest the expressionless automatons of the strip with distinctive melancholic outlooks. Stone himself provides ‘2631’ (below) a cuttting piece of satirical social commentary that takes us on a tour of the far future’s Interplanetary Meme Archive and shows us how the online world will be interpreted in centuries to come. Interspersed throughout are one-page strips by Lara Callaghan depicting music stars Rihanna, Iggy Azalea and Britney Spears engaged in regular household chores like washing up dishes and cleaning the toilet; their apparent incongruity wittily punctuating the rest of the book. A diverse line-up of perspectives on the subject matter then that encompasses everything from David Bzatt’s exploration of mental health in the workplace to to Aled Lies’ medieval fantasy (top banner image), amongst so many others. It’s always a pleasure to spotlight projects like this because they represent grassroots comics community at its very best. You can find out more about the Work in Progress meet-ups here. Give them your support if you can at Thought Bubble. Initiatives like this are invaluable, after all, in helping to nurture and develop new talent. You can follow the Work in Progress group here on Twitter and visit their site here. You can buy the book from Joe Stone who is at Table 51A in the ComiXology Marquee at Thought Bubble.